During a recent Sociology of Education class at UW Bothell, a reticent student pointedly told Jane Van Galen she never talked about her family or her childhood—and certainly didn’t want to share her story in a video. But Van Galen gently persuaded her and her fellow students that their personal experiences provided rich and relevant connections to course material—experiences that could be shared much more powerfully through digital storytelling than a more formal academic paper. 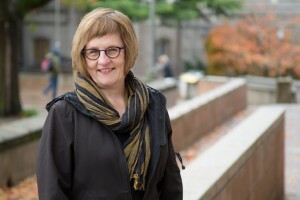 Van Galen, a professor in the School of Educational Studies at UW Bothell, is working to show faculty that the medium is an effective pedagogical tool that can help enhance student learning in multiple subjects across the curricula. She has been teaching and researching digital storytelling in the classroom for about 10 years. Research has shown that multimedia can help the “digital generation” better understand complex issues. When students are asked to share their own stories within the context of what they’re learning in class, the lessons become more deep-rooted. The process of creating a digital story or documentary pushes students’ learning in multiple ways. Students tap into their creative talents, do careful research, think deeply about the question being asked and pay close attention to their script-writing. Many of Van Galen’s students improved their communication skills because they had to organize their ideas and construct their narrative in such a way that the audience can understand a complex subject. Digital storytelling is the art of well-told stories. They’re often personal in nature but not always produced in video form. Students use a large array of multimedia tools such as video, audio, graphics and web. And much like traditional storytelling, its digital counterpart also relies on a particular point of view to explore insights into the broader human experience. In classrooms, the ideal video is less than 10 minutes—Van Galen tells her students to keep the length of videos between three and five minutes. Their creation and final presentation is more manageable and the story more focused. And because digital storytelling is a flexible form, it can be used in a variety of classes, said Van Galen. She recently taught a class directed at educators: “Telling our Stories as Teachers: Digital Storytelling and Teacher Reflection.” She also held a three-day storytelling class for biology instructors who wanted their students to be able to convey their personal investment in key environmental issues. In her research, Van Galen focuses on social class and social mobility through education. So she knows her students—many of whom hope to become teachers—bring rich but sometimes painful personal histories that could unknowingly influence their lives as educators. The School of Educational Studies’ vision is to develop educators who will promote and support equity in learning. Van Galen asks her students to share personal stories through digital storytelling because she hopes that experience will help them better understand how they can teach students to be more inclusive and more understanding of the diversity of experiences everyone brings into the classroom. In one of her classes, Van Galen asked her students to explore through their own experience the cost of social mobility and the intersection of social class and education. “Many of my students have never told their stories as part of their academic work,” Van Galen said. When they realize that their stories are relevant to what they’re learning, and that other people have an interest in their personal stories—or that they relate to or are inspired by them, “it is very affirming,” she said. That was the case for Norma Perez, a student who originally found digital storytelling challenging. And yet, the powerful learning experience made her think deeply about what she could contribute as an educator. Norma Perez realized the process of telling her family’s story in Jane Van Galen’s class could make her a better educator. “The story I chose to tell reflects the first time I realized my own family, my friends, my neighborhood—we were poor. Growing up in my neighborhood, everyone’s family looked like mine. My mom worked in the candy factory, while my dad worked on the construction site. We spoke Spanish at home and we lived in an apartment. This was normal to me,” she said. Crafting the script for the video was the most difficult part, but it was easier finding images to complement her words. When she finally put it all together, and then got to see her classmates’ work, Perez saw how their individual stories revealed what inspired them to become educators. Consider taking a short course in digital storytelling: In addition to workshops she offers with UW colleagues, Van Galen periodically co-teaches three-day workshops at UW Bothell with the StoryCenter, a pioneer in digital storytelling, based in Berkeley, Calif. These workshops are open to faculty and staff from all three campuses as well as community members. Email Van Galen for upcoming course information. Don’t sweat the technical details too much: Many of today’s students are digital-savvy, with access to all kinds of multimedia tools. In one of Van Galen recent classes, students used as many as eight different video-editing tools. “Some of my students used their cellphones to edit their videos. They know how to work with the basics of these tools, so you don’t have to spend much valuable classroom time showing them how to work a video-editing program. “Video editing software is increasingly more intuitive and easier to use. I only spend 20 minutes or so demonstrating a couple of different tools,” said Van Galen, who occasionally helps students troubleshoot technical problems and provides links to online tutorials and help forums. Set creative constraints to help students focus their project: The script should be 300-350 words, with a story told in three to five minutes. Van Galen will often ask her students to use Ken Burns-like effects to produce their videos. Burns, an American documentarian, relies heavily on still images in his renowned Civil War documentary. He brings them alive with panning and zooming techniques paired with voice-over and evocative music. Images are important but pay attention to sound: “Students are often surprised how important sound is,” Van Galen said. It evokes emotion and helps viewers understand subtle points. “Music creates ambiance; music supports the tenor of the story. Teach students to attribute materials: Creating new digital content is an ideal opportunity to teach the importance of crediting the work of others, including the value and importance of attributing copyrighted material. “There’s no such thing as a ‘Google’ image. It belongs to someone,” she said. That also applies to music, even when it is available royalty-free. UW has its own website explaining copyright and how to properly cite copyrighted materials. Students control who sees their stories: “You must deal with your students’ stories with sensitivity,” Van Galen said. While students are expected to share their work in class with fellow students, they decide whether anyone else gets to see the videos. Posting their own videos on the web is always optional. Finally, storytelling is everything: Van Galen spends a lot of classroom time talking about the arc of a story and what makes a powerful narrative. First, she gets students comfortable with switching from an academic to a narrative voice; talking in the first person using “I” and “me” is acceptable. And she helps them think deeply about visual metaphors. “What can the visuals do for the understanding of the story?” Van Galen asks students. And these kinds of discussions lead to talking about those little things that make up a whole story. Arts and Humanities in Higher Education. (2008, Special Issue) Cross Currents of Pedagogy and Technology: A Forum on Digital Storytelling and Cultural Critique. Vol 7(2). Benmayor, R. (2012). Digital testimonio as a signature pedagogy for Latin@ Studies. Equity and Excellence in Education, 45, 3 507-524. Carmona, Judith Flores and Luschen, Kristen V. (2014). Crafting Critical Stories: Toward Pedagogies and Methodologies of Collaboration, Inclusion, and Voice. Peter Lang. Gubrium, A. and Harper, K. (2013). Participatory Visual and Digital Methods. Routledge. Hull, G., & Katz, M. (2006). Crafting an Agentive Self: Case Studies of Digital Storytelling. Research in the Teaching of English, 41(1), 43-81. Lundy, K. (2008). (Ed.) Digital Storytelling, Mediated Stories: Self-Representation in New Media. Peter Lang. Myers, Brann, & Members Of Comm 600. (2009). College Students’ Perceptions of How Instructors Establish and Enhance Credibility Through Self-Disclosure. Qualitative Research Reports in Communication,10(1), 9-16. Professor Jane Van Galen, who partners with the StoryCenter to teach classes on digital storytelling, always discusses the center’s useful seven steps for people who want to create digital stories. Owning your insights: What is the story you want to tell? Why? Owning your emotions: What are the emotional currents in your story? How do you want to convey these emotions? Finding the moment: What is the defining insight of your story? When did things change? Seeing your story: Think about how your insight can be brought to life. Show, don’t tell. Hearing your story: Think deeply about how music or other sounds support your insight. Assembling your story: Consider structure and when to reveal your insight to the audience. Sharing your story: What life will your story have after it’s complete?